I have been meaning to share this recipe from long time. But as some of you know (facebook fans) I have got tendonitis in my right wrist and doctor has asked me to give it rest. And I am a right-handed so it has been pretty tough and boring because of limitations. But by God’s grace and V’s full support, it is recovering pretty well. I still need to take precautions like wear a wrist brace strictly for few more weeks, ice massage n do some special exercise. So hopefully I will be able to get back to normal routine pretty soon. 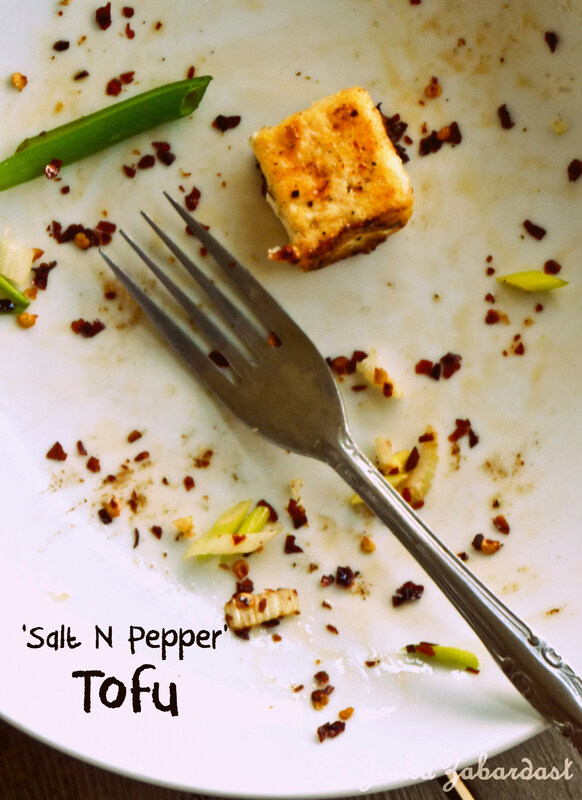 Salt and pepper tofu – way too simple, quick, healthy, tasty and comfy! That says it all about this dish. It gets ready in minutes and it is super healthy because of course of tofu. 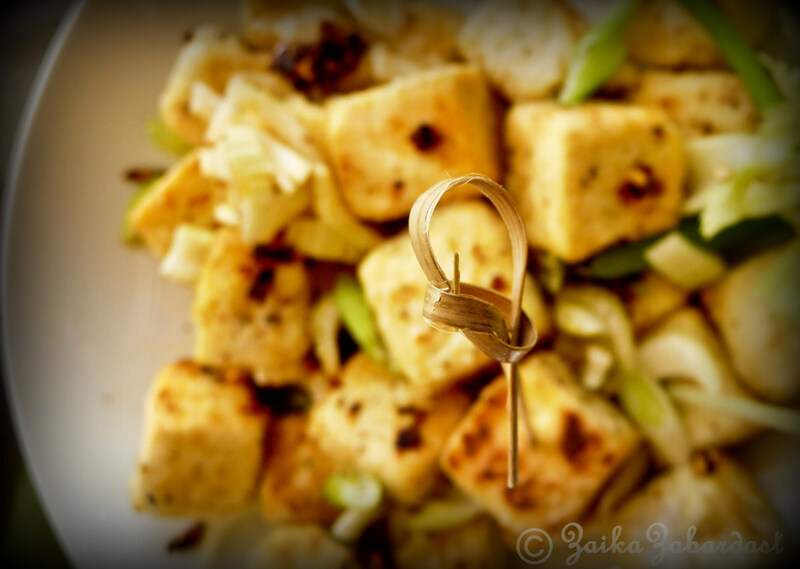 By any chance if you are a tofu lover like me, you are surely going to love this recipe. I remember when I tried this dish for the first time at our favorite restaurant “Lucky Palace” in Pocatello. We used to go there a lot – almost on every occasion. The owner was such a nice woman. Her warm welcome used to make us go there again and again. Too bad the restaurant closed down because of recession and till this day I haven’t had same salt and pepper tofu! The magic key to get this dish right is to season it properly with salt and pepper. Not much or no less – just properly seasoned. Perfect seasoned dish can literally win over any dish that is under seasoned. You know who am I thinking of right now when I say “Properly seasoned”? Mr. Ramsay! I can literally hear his voice in my head – saying “Under seasoned/properly seasoned” to his Master chef season 3 contestants. I love this show not only because it is a cooking show but it is very inspiring. Do you watch the show? If not, you are really missing out. There is this one contestant Christina, who is BLIND but oh boy she is outstanding! No matter what you give her to cook, she does an incredible job. Brave and inspiring are the words for her. 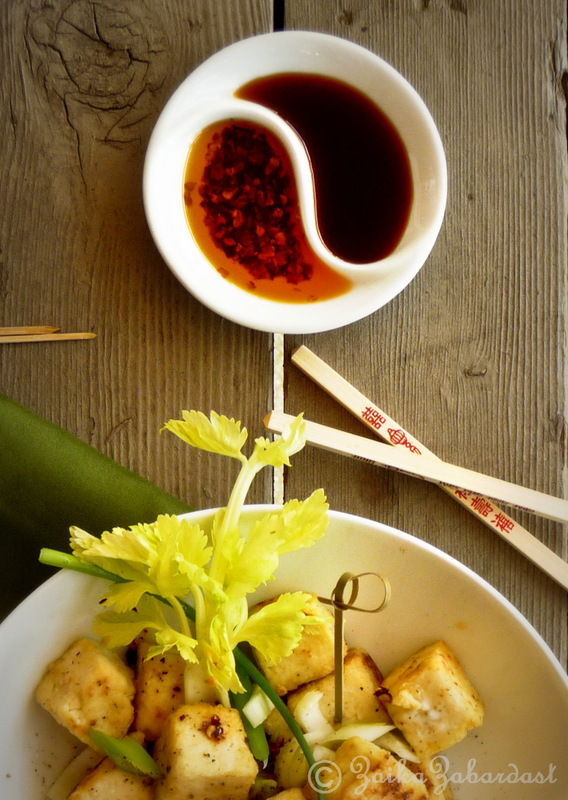 Coming back to the recipe, traditionally tofu is deep-fried in this recipe. But I used shallow fry method and used EVOO to make it healthier. But you can definitely go for deep-frying method using normal canola/vegetable oil. I am sure you will love this comfy, healthy n quick recipe. 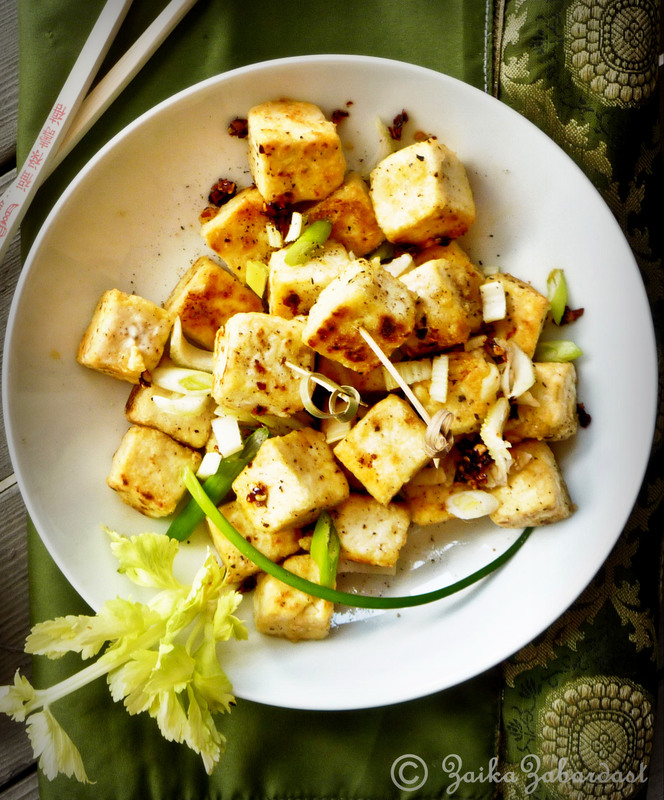 Here’s what you need to make crispy salt and pepper tofu. Drain tofu very well. Cut in to one inch cubes and keep it aside. In a medium zip-lock bag, add corn starch, salt and pepper. Mix well. Add tofu pieces to the corn starch mixture. Zip the bag and toss it well. Make sure all the tofu pieces are well coated. Heat EVOO in a non-stick skillet on medium heat. Fry tofu pieces in a batch. Do not crowd up, otherwise it won’t crisp up. Turn the sides in between using tong or toss the tofu (chef style). Serve it on a platter with toothpicks. Garnish with chopped celery and green onions. Oh and do not forget to sprinkle some freshly ground black pepper. It goes very well with simple red chili oil. If you do not know how to make it, let me know. Make sure the pan is hot enough otherwise tofu won’t crisp up properly. Celery n salt and pepper tofu are like perfect match. For me, I have to have one piece of celery with each tofu piece along with bit chili oil. Just comfy! So do not skip on celery, you will love the combo. I really love Trader Joe’s tofu. It is organic yet cheaper than normal tofu. So go for Trader Joe’s tofu if you have the store close by. Question: Do you like Tofu?? Yes/No – why? I am crazy for tofu. I can have it all day every day. yum! i have a block of tofu in the fridge that i want to use up soon – will have to try this recipe. thanks for sharing it! Oh I do love this recipe and of course tofu. I just made some marinated and grilled on my pannini maker,LOL. Beautiful enticing photos. Arvind will just not eat tofu 😦 This really looks nice, I will make it just for me. Looks delicious, but I admit to generally failing at fried tofu. Maybe I will try again. I have never tried cornstarch. I made this last evening for dinner. It came out really good and so easy to make also. Celery was a perfect combination. Thanks for posting this recipe. This looks simple and delicious. I must try. I already have those toothpicks. :) Sorry about your tendonitus. And yes, a proper seasoning is all the difference in the world!